First transfer 1860 (No. 1–3 in all catalogs): Stamps without frame lines (except the 12c which can show broken dividing lines between the stamps) on handmade thickish hard paper of 3 to 3.7 mils thickness, mean 3.3 mils (84 µm), set 1.5 to 2 mm apart, and perforated 12 (11¾ to 12¼). Gum is yellowish-white and shiny. Colors are generally described as “deep” and “rich”, as opposed to the other transfers, but in reality only the 24c can easily be identified by color alone. Second transfer 1864 (SG 4–6, Scott 7–9, Michel 4–6): Stamps with an extra frame line 1 mm all round and stamps more widely spread (approx. 4 to 6 mm) on the sheet, according to Michel catalog normally perforated 11, but 24c also perforated 11½ x 12 and 11½; other sources give perforations of 11 and 12 exactly. On medium grayish to white wove paper of 2.2 to 2.9 mils, mean 2.6 mils (66 µm). According to some sources also on very thin, almost pelure, white wove paper. Gum is thick and yellowish, generally crackly. Colors are rather dull and closer to those also found in the fourth transfer. Third transfer 1867 (SG 10–12 as fourth transfer, unlisted in Scott and Michel): Like second transfer, but stamps placed more closely together (distance between stamps about 2 to 2½ mm) so that the extra frame lines (which are only partial in places) appear as double frames on two or more sides on some stamps. Exists perforated 12 exactly and with irregularly placed holes gauging from 11 to 12. This issue is on very thin, almost pelure, white wove paper of 1.5 to 2.1 mils, mean 1.7 mils (43 µm). Gum more thinly spread, smooth, shiny and white. Colors generally quite pale, but at least one of the two 6c stamps in my possession does not have the same washed-out appearance as my 12c and 24c stamps whose colors are indeed easily distinguishable from any other issue. Fourth transfer “1866-1869” (SG 7–9 as third transfer, Scott 13–15, Michel 7–9): Like first transfer with no extra frame line except on the 24c which can show faint signs of extra frame lines on one or more sides. Stamps approximately 2 to 2½ mm apart and usually perforated 12, 6c also perforated 11½ x 12 (Michel). Gum is smooth, shiny and white to yellowish white. Paper is thinner on average than in first transfer, 2.4 to 3.2 mils, mean 2.9 mils (74 µm). Colors are usually less saturated than in the first transfer, but the 6c and 12c stamps come also in shades which can be found in the first transfer as well. First and fourth transfer can be very difficult to distinguish. Usually, and especially when examined under sunlight, a true no. 1 will have a more "rosy" red color than all the other transfers (not reproducible with my scanner), whereas the red shades of the third transfer tend to be shifted a bit more towards the orange side of the spectrum. Also, the paper of number ones is different from that of the fourth transfer, it has a smooth appearance and the paper mesh is hard to see. Paper thickness is also a good indicator, but should not be used alone as ranges overlap and some copies are impossible to identify conclusively based on thickness. This replating of a complete sheet of Scott #13, performed by Henry Chlanda, and the overlays pointing to the characteristics of each position are based on a study of two sheets by B.W.N. Miller and Colonel C.G.S. 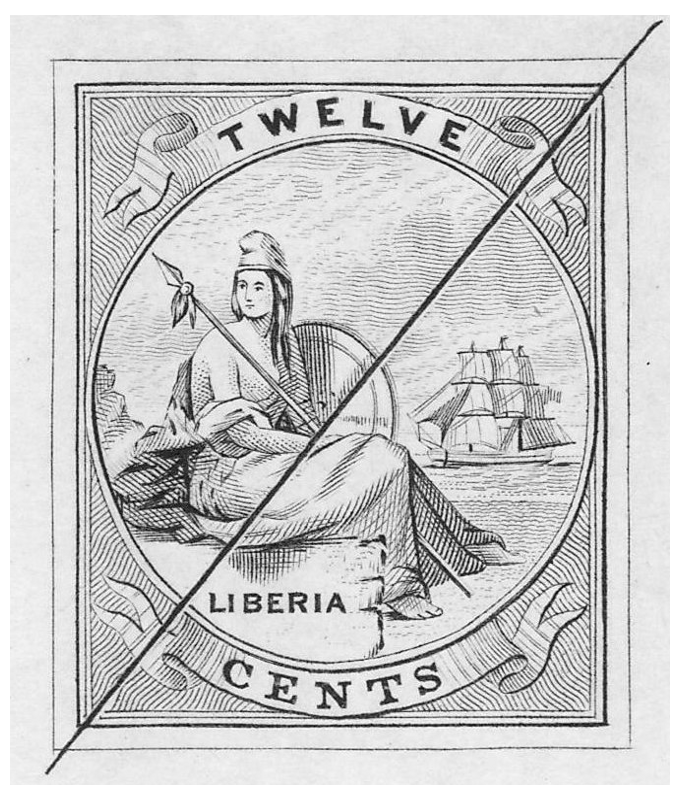 Harvey., as published by Philip Cockrill in his LIBERIA series booklet no. 3. Secondary flaws, i.e. flaws not present on both sheets, are marked as such. Personally, I found it very difficult to identify my own stamps using only the verbal descriptions as a guide – I failed on several occasions – and I believe there is much room for improvement. Therefore, I am very glad I am now able to show pictures of actual stamps, making it much easier to recognize the flaws. This plating is probably the most important tool for identifying a number one through the process of elimination: if your stamp doesn't match any of the positions below and fulfills the criteria given above for being a number one, it is definitely worth being sent to an expertizer. Color is not a good idicator as both first and fourth transfer show a wide range of shades, from deep to dull blue to ultra. Nevertheless, both transfers are easily distiguished by examining the ship. For the fourth transfer, the engraving of the hull must have been reworked: gun ports were removed leaving only a white line instead, and by raising the waterline with respect to the hull, especially to the right, the whole ship appears to be drifting much deeper in the water (see defaced die proof). Also, stamps of the fourth transfer never show the faint dividing lines sometimes visible on the first transfer. The 24c stamp of the first transfer has a characteristic, deep green color with a stronger component of blue than any of the other transfers, especially the fourth which is more yellowish green. Also, stamps of the first transfer never show the faint (double) frame lines sometimes visible on the fourth transfer.